In the Northeast, the historical probability of severe weather (tornadoes, hail, or strong winds from thunderstorms) increases from late March through late September, with a peak over the summer during June and July. One of the main ingredients for severe weather is warm, moist air, which is mainly present from late spring through the end of the summer, although severe weather can occur at all times of the year. 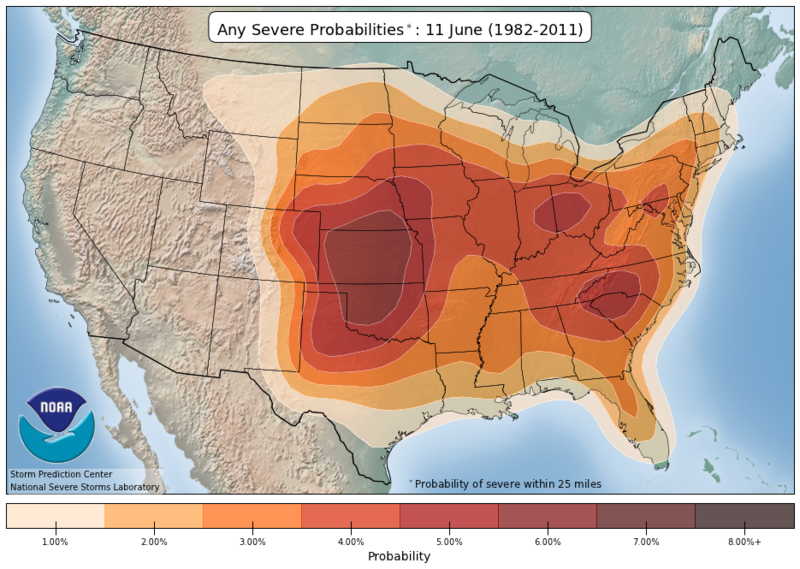 Historical probability of severe weather within 25 miles on June 11. Image from the Storm Prediction Center. Tornadoes might seem like a weather phenomenon that mainly occurs in the Midwest, however the Northeast is no stranger to them. At least one tornado has touched down in the Northeast every year since 1952. Based on data from 1985 to 2014, the average annual number of tornadoes for the region is 46. The Northeast typically records at least one tornado per month from April through November, with the greatest number (13) in July. 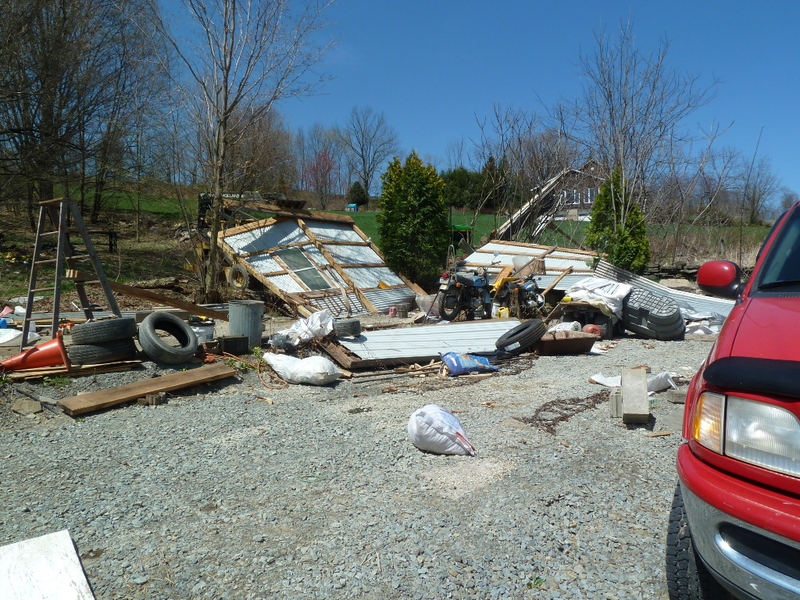 During the May 15th severe weather outbreak this year, there were seven confirmed weak tornadoes (EF-0 or EF-1) and one EF-2 tornado in Putnam County, NY. 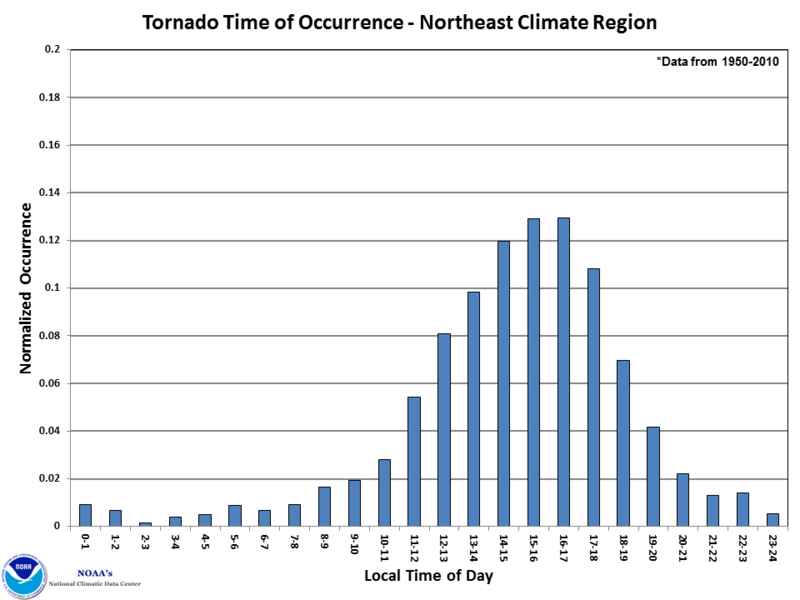 In the Northeast, tornadoes most frequently occur during the afternoon and evening hours. Although severe weather is more common during the spring and summer months, it can also occur during wintertime. 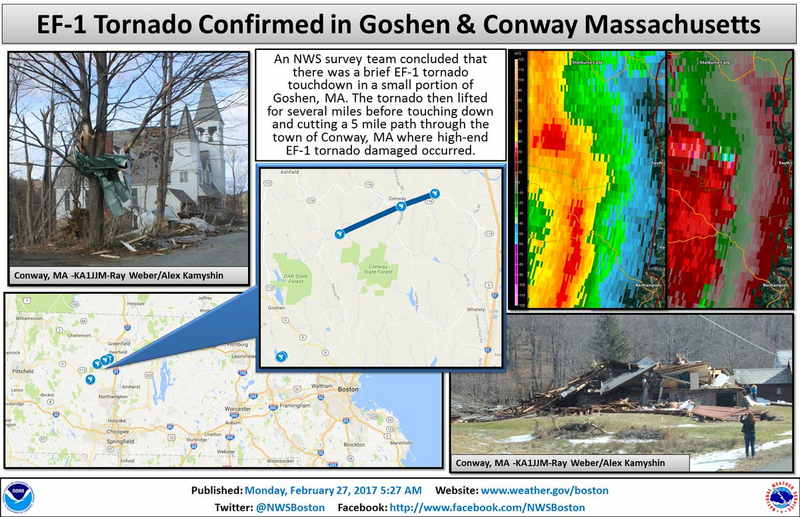 An EF-1 tornado in Conway, MA was on the ground for five miles in February of 2017, and more recently, another EF-1 tornado was confirmed in Uniontown, PA earlier this year during the month of February. In both instances, those were the first February tornadoes recorded for Pennsylvania and Massachusetts since records began in 1950, according to the National Weather Service. The tornado in Conway, MA was on the ground for five miles. Photo courtesy of NWS Boston. Thunderstorms can also produce straight-line winds, which can be as strong and damaging as some tornadoes. The National Centers for Environmental Information (NCEI) storm database reports straight-line winds up to 100 mph were recorded in parts of Pennsylvania and New York in May of 2017. Straight-line winds up to 110 mph destroyed this building. Photo from NWS Binghamton. Large hail doesn’t occur as frequently in the Northeast as in other parts of the country. However, the largest hailstones in the region have ranged from 2.5" (tennis-ball size) to 4.5" (softball size) in diameter. Be sure to visit the Storm Prediction Center for updates on the latest information about severe weather watches, warnings, and reports of storm damage.